GULLS!! Don’t you love ’em?!?!? I’ve recently received a couple requests to comment on the occurrence of Thayer’s (or at least “Thayer’s-like”) Gulls in Newfoundland. 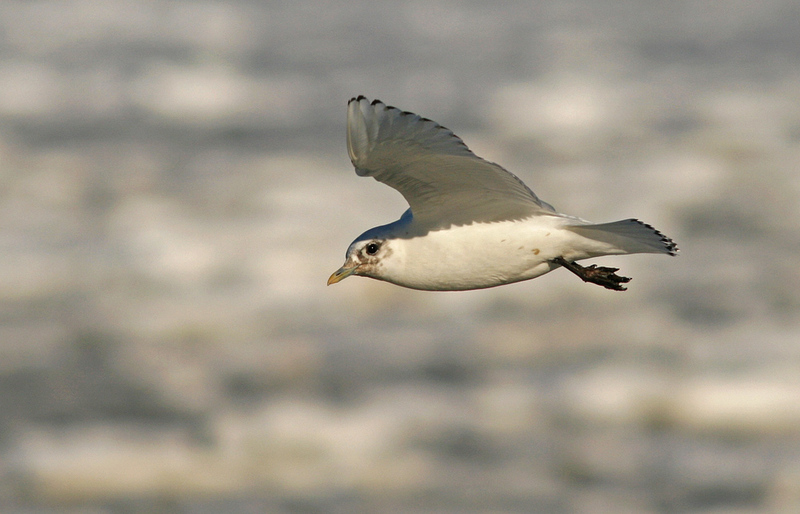 Thayer’s Gull breeds in the Canadian Arctic, and winters mainly on the Pacific coast. It is considered unusual east of the Rockies and outright rare on the east coast. 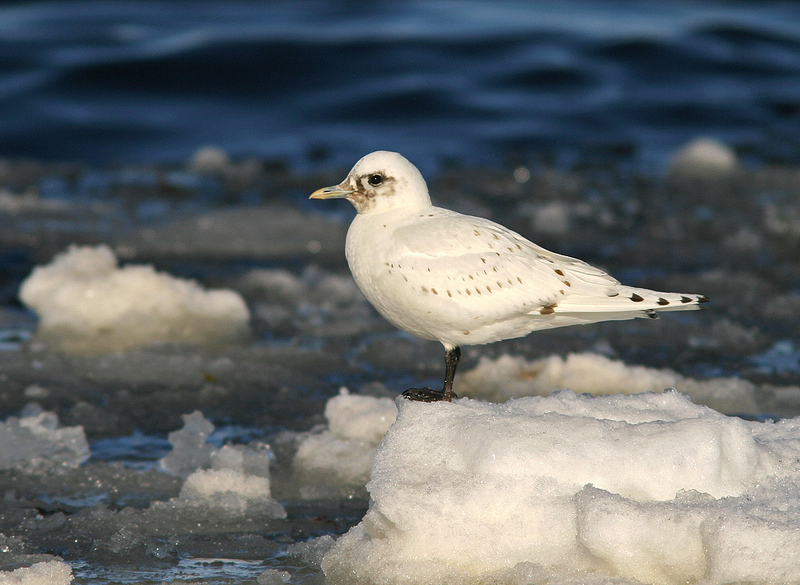 A major issue in Newfoundland comes in separating Thayer’s Gulls from the sometimes very similar “Kumlien’s” Iceland Gull that winters here in large numbers. These two can overlap in almost every respect, have at times been considered clinal variations of the same taxa, and are known to occasionally interbreed. 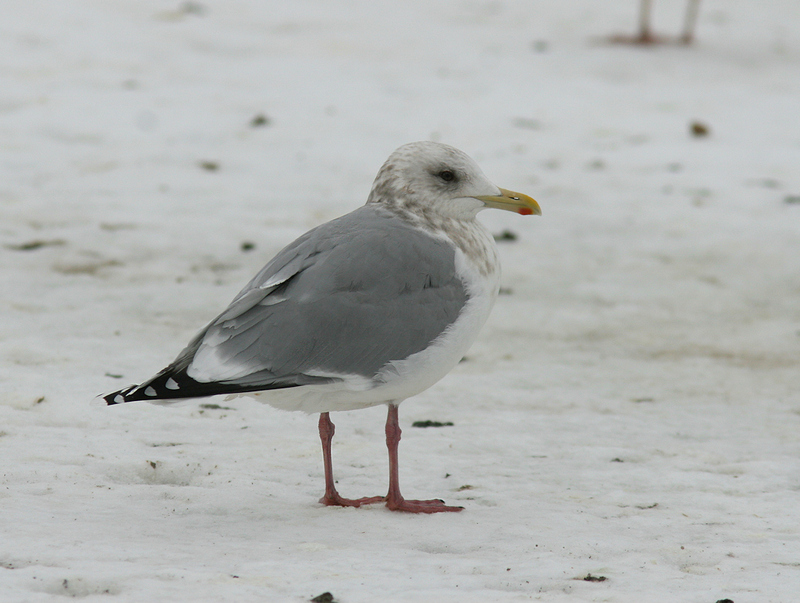 For avid winter gull-watchers in St. John’s, it is not unusual to see an individual from time to time that, at least initially, appears to be a candidate for Thayer’s Gull. 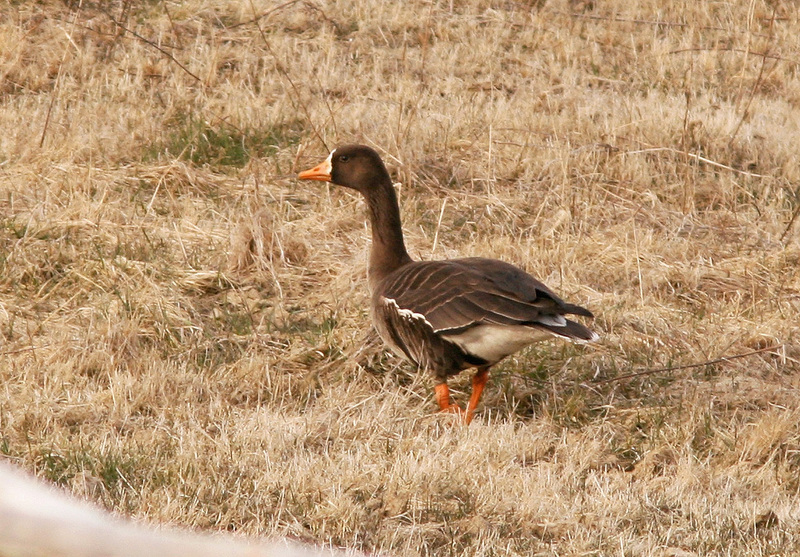 The majority of these birds are first winter types, which arguably are more difficult to “pin down”, and often show at least one inconsistent field mark. Interestingly, potential adult Thayer’s Gulls are few and far between, with solid candidates occurring less than annually. In this post, I’ll give some examples of adult “Thayer’s-like Gulls” that have been observed here in recent years and discuss the challenge of identifying them. The point of this discussion is not to identify each bird to species, and in most cases I won’t even venture to conclusively accept or rule out Thayer’s Gull. Instead, I hope to point out the “pro” Thayer’s Gull features that make each bird a candidate in the first place, and then highlight some of the (often recurrent) concerns that emerge in making that identification. 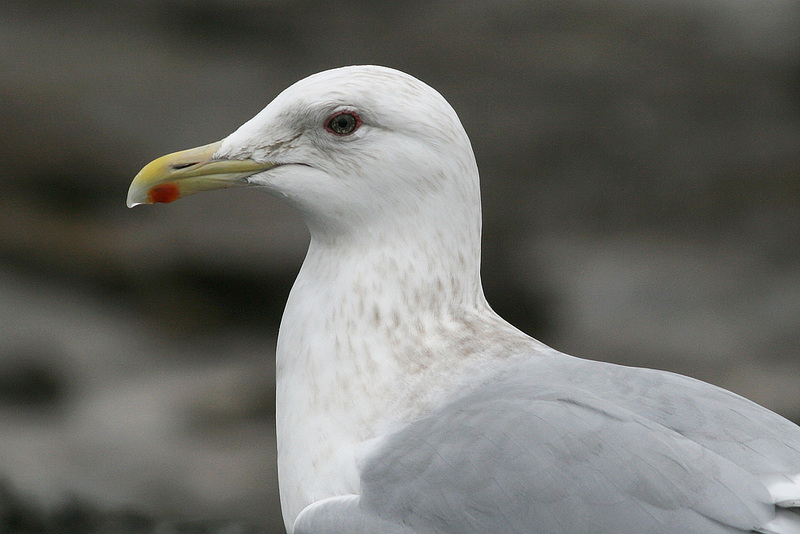 This bird immediately gives the impression of a classic Thayer’s Gull – strong, with a squared off head, sloping forehead and relatively long, hooked bill. 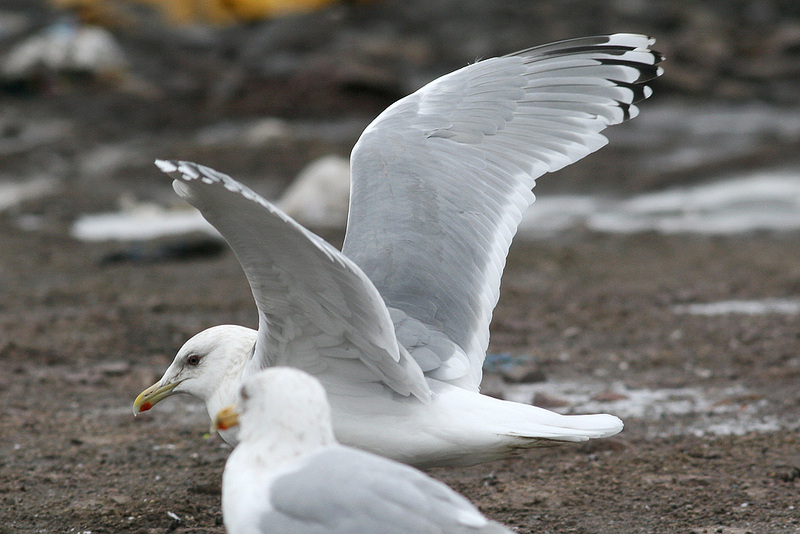 The folded wingtips appear black rather than the charcoal grey sometimes exhibited by Kumlien’s Gulls. The mantle was slightly darker than nearby Herring Gulls and the legs a bright, deep purple. Close-up photos show that the eye is in fact completely dark, and the pupil only discernable in direct light. The blotchy head streaking is also more consistent with Thayer’s rather than Kumlien’s Gull. 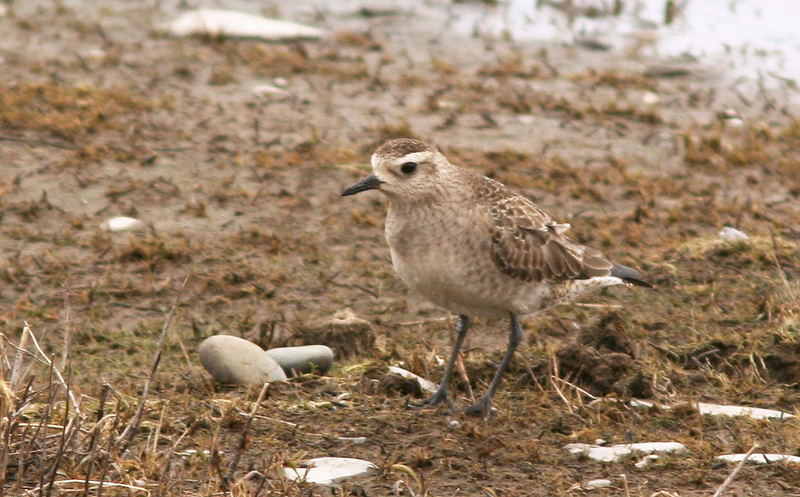 Unlike the other candidates described below, this individual had a full suite of features that were consistent with Thayer’s Gull and would be either very atypical or inconsistent with Kumlien’s Gull. 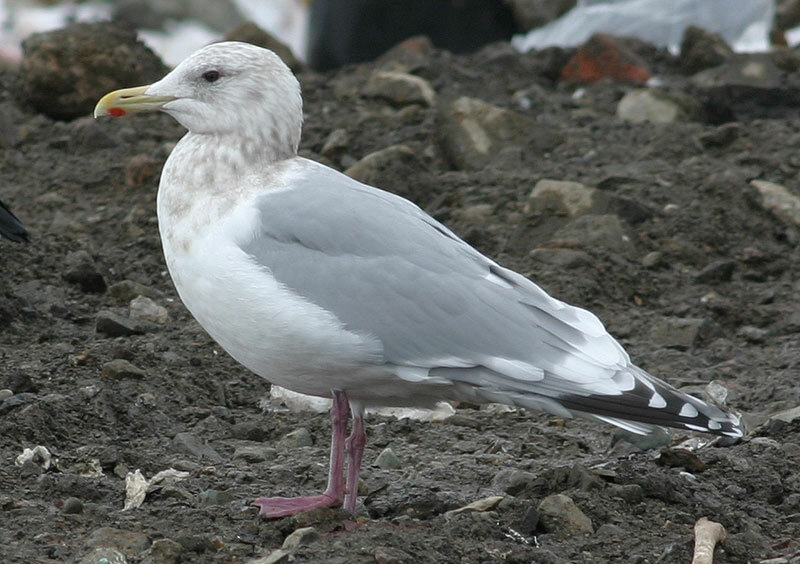 Structurally, it more resembled a Herring Gull than an Iceland Gull, with a blocky squared-off head, sloping forehead and relatively long, hooked bill. The wingtips appeared dark slaty black when folded (as opposed to the more grey-toned wingtips usually shown by even the darkest-winged Kumlien’s Gulls) and showed a textbook “Thayer’s wingtip pattern” when spread (see photos below). The mantle was a shade darker than surrounding Herring Gulls, and the legs and orbital ring a deep purple that appeared darker and richer than typically found on Kumlien’s Gulls. The bill exhibited a pale greenish base and tip that is often noted on Thayer’s Gulls, while the eye was completely dark. 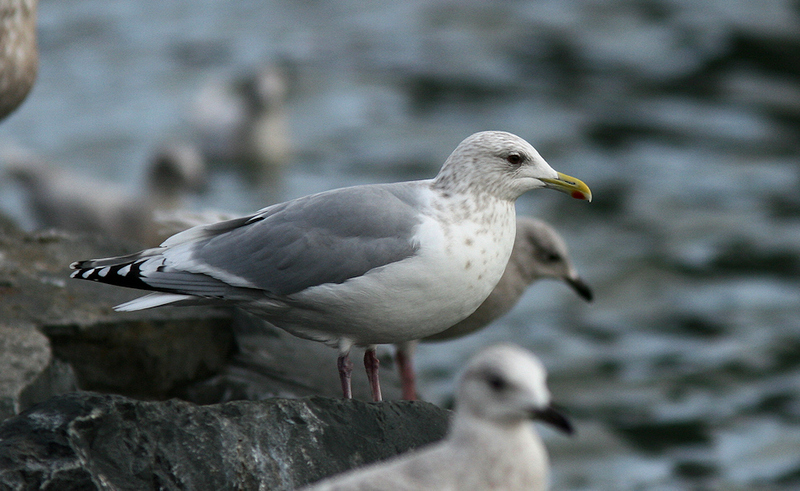 While darker eyed Kumlien’s Gulls are not uncommon, close inspection virtually always shows obvious dark flecking. The wingtip pattern is a good fit for Thayer’s Gull, including a partial subterminal bar at the tip of P10, a complete black leading edge to P9 (i.e. the mirror does not span both webs) that reaches the primary coverts, and a small black mark on P5 – all features that are inconsistent with Kumlien’s Gull. There is minimal contrast between the darkness of the inner and outer webs on P10 – another good mark for a true Thayer’s Gull and a feature found on very few other candidates. 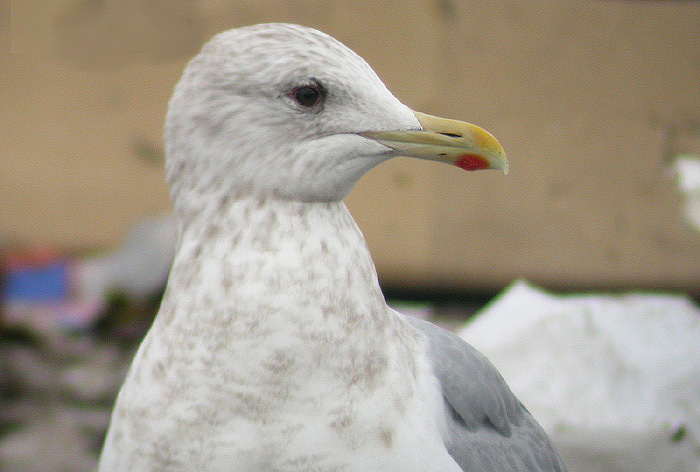 While a small minority of adult Kumlien’s Gulls may exhibit one or two of the features described above, the full suite shown by this individual makes for an almost no-contest conclusion – Thayer’s Gull. But what about some of the other candidates?? Compared to Herring Gull (background) note the dark eye, deep purple legs, similar head shape and similar jet-black wingtips when folded. The gonydeal angle is relatively stronger than one might expect of Kumlien’s Gull. 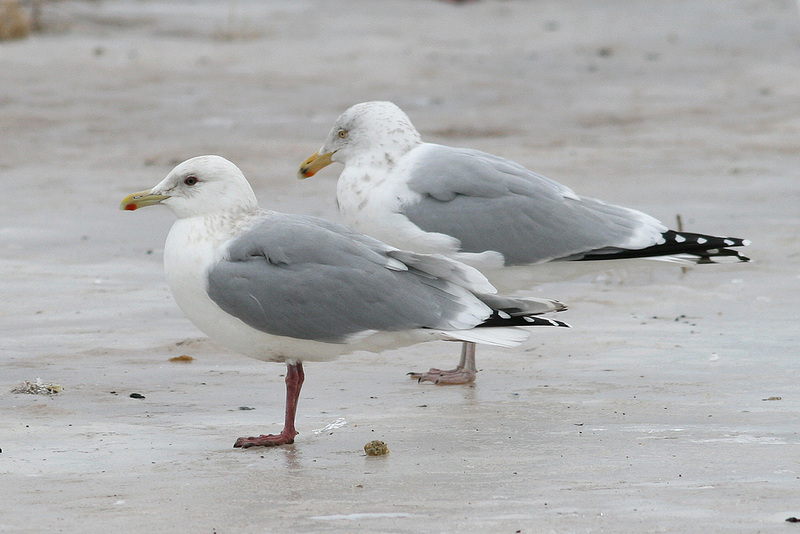 Bruce Mactavish and I found another adult “Thayer’s-like” gull at the landfill on March 1, 2009. Like the individual described above, this bird had wingtips that appeared completely black when folded, a mantle barely darker than nearby Herring Gulls, and deep purple legs and orbital ring. 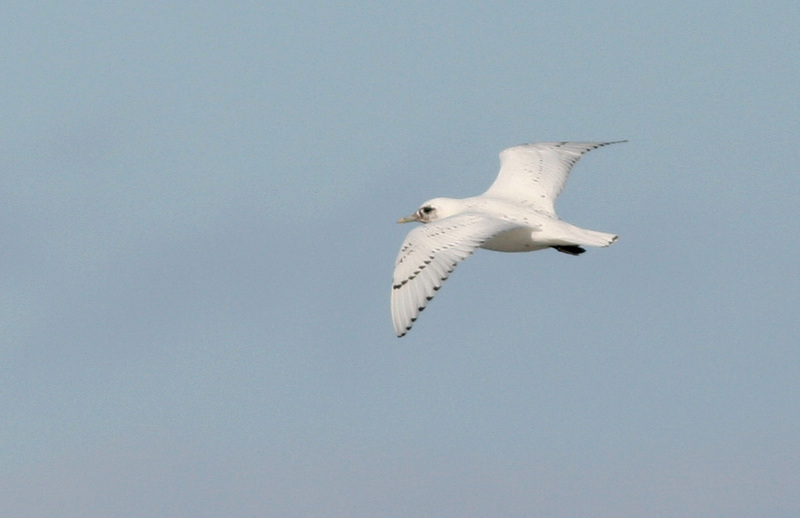 The eye stood out as dark from any distance, but close inspection showed this to be an effect of heavy dark-flecking (not uncommon in Kumlien’s Gulls) rather than a completely dark iris. 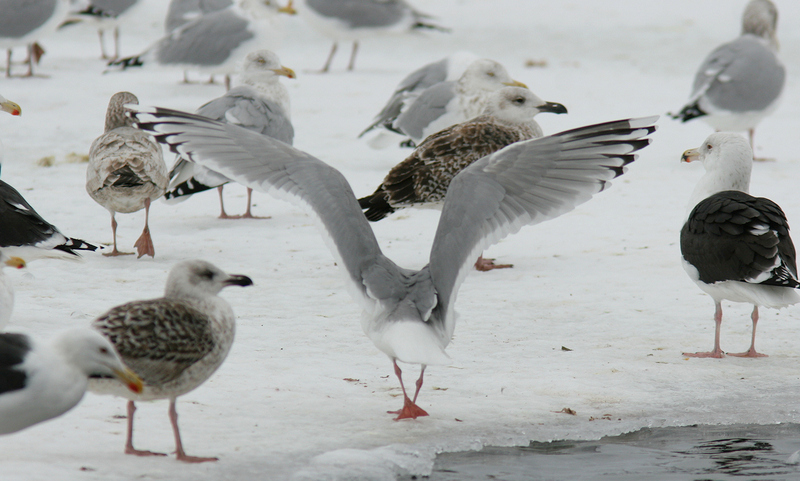 When spread, the wingtips showed a few inconsistencies that, while not necessarily outside the range for Thayer’s Gull, make a solid identification problematic. No doubt this bird would easily pass as a Thayer’s Gull within its normal range on the west coast, but just doesn’t cut the mustard out here on the rock, where only the most “Thayerish” of Thayer’s Gull might be safely identified. A close-up of the eye reveals a lot of dark flecking against a paler iris – not the completely dark eye that would be considered ideal in order to “nail” a Thayer’s Gull here on the east coast (but admittedly not atypical of that species, either). The most significant knock against this bird is the lack of a completely black leading edge to P9. Instead, the mirror spans both webs – a trait shown only by a minority of Thayer’s Gulls and making it more difficult to rule out an extreme Kumlien’s Gull or intergrade. The notable contrast between the black outer web of P10 and the much greyer inner web is similarly problematic. The staring dark eye and dark black wingtips make this bird look like a perfect candidate for Thayer’s Gull. It’s difficult to argue that a Kumlien’s Gull could ever look like this. 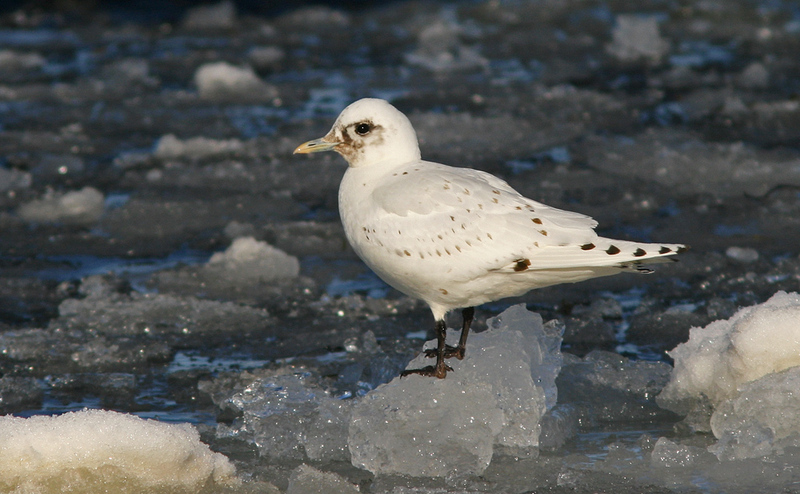 This gull, found and photographed by Dave Brown in St. John’s harbour on January 8, 2010, is another excellent example of the tricky situation we find ourselves in. The photos show a gull with all the right stuff to be a Thayer’s Gull … slaty black wingtips when folded, a near perfect wingtip pattern when spread, and an apparently all-dark eye. Even the structure looks great, with a blocky head and sloping forehead that gives a different impression than most Kumlien’s Gulls. However, like most candidates we see, the major strike for this bird is the significant contrast between the blackish outer primary webs and the much greyer inner webs (especially on P10). The head streaking is also quite well defined, compared to the blotchier streaking often seen on Thayer’s Gulls (but again, this varies). At first glance, the wingtip pattern looks good, too – a complete subterminal band on P10, a fully black leading edge on P9 and significant amount of marking on P5. However, the very notable contrast between the black outer webs and the much greyer inner webs (especially on P10) raise some serious concerns. Could this be a Thayer’s x Kumlien’s Gull intergrade?? This was the longest-staying, most studied of all the individuals described in this post (despite the somewhat less quality photos I have to offer!). 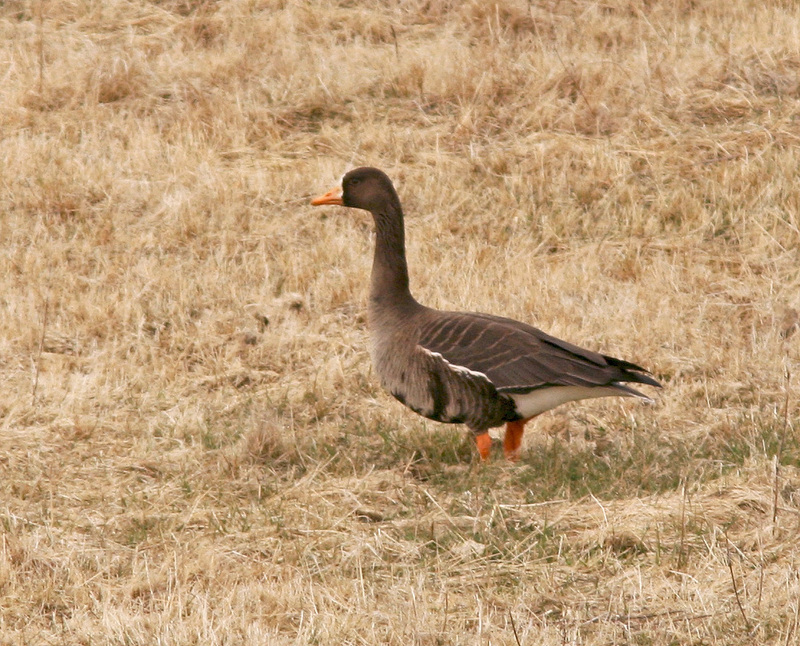 Originally pointed out by Dave Brown, most birders in St. John’s (and plenty from away) saw this bird over the course of several weeks since it was reliably found at one sewer outfall in the harbour. 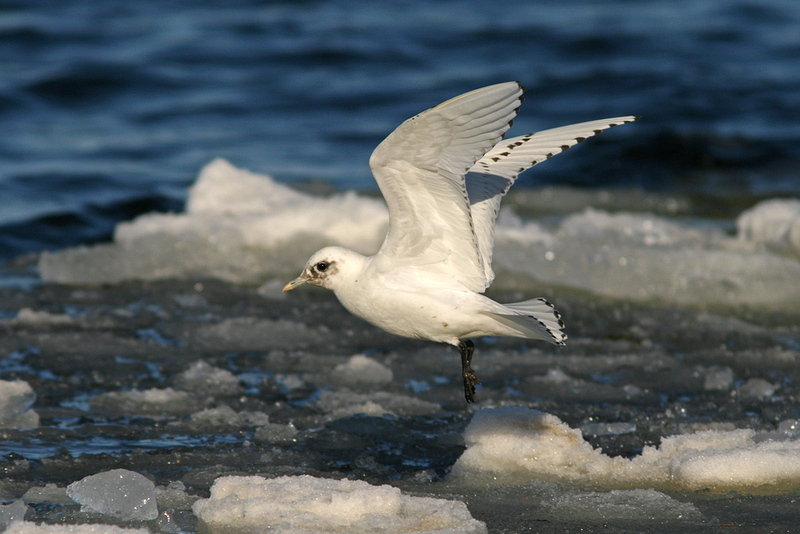 In life, this bird could often be picked out from surrounding Kumlien’s Gulls by virtue of its slightly darker mantle which is not clear from the photos. The dark eye and slaty-black wingtips on this bird helped it stand out from the crowd (which was made up almost entirely of Kumlien’s Gulls) at the city’s main sewer outlet. Not evident in the photo, but obvious in life, was the slightly darker grey mantle. 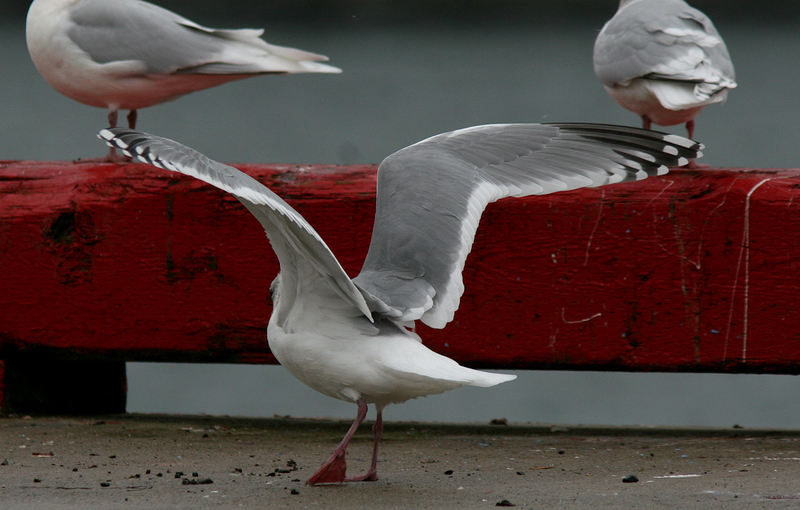 Overall, however, the structure was more or less consistent with a typical Kumlien’s Gull. The eye appeared to be completely dark and not simply dark-flecked as in many Kumlien’s Gulls. My two concerns with this bird, however, are the somewhat petite structure (the head and bill were not noticeably different from many typical Kumlien’s Gulls) and the contrast of the black outer primary webs with the notably greyer inner webs – a trait seen more often in dark-winged Kumlien’s Gulls than in known Thayer’s Gulls. Otherwise, the overall wingtip pattern could be considered fine for the latter. Like the last gull, this one showed a wingtip pattern that superficially looked great for Thayer’s Gull – a complete subterminal bar on P10, a black leading edge to P9 and a small dark mark across both webs of P5. The dark leading edge of P9 extended all the way to the primary coverts. However, the inner primary webs were much greyer than the black outer webs, especially on P10 and P9. This is the same gull featured in the photo at the introduction of this post. 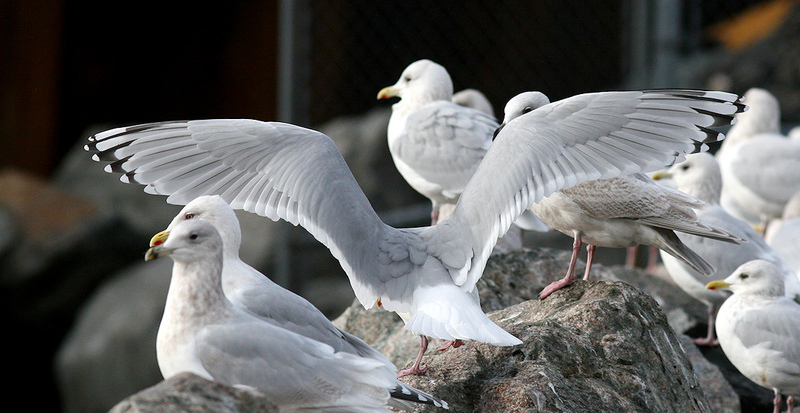 The Herring Gull-like structure, dark eye and black folded wingtips make this bird stand out as obviously different in a typical St. John’s gull flock. The mantle appears as dark as, or maybe a shade darker than, nearby Herring Gulls. Another one-time wonder found and photographed by Dave Brown, this gull would not easily be confused with Iceland Gull. In fact, at first glance the dark eye was the only trait that made it stand out from surrounding Herring Gulls. Unlike several of the gulls described above, the legs were not a deep purple, but instead matched the majority of Kumlien’s Gulls that we see. When the wings were spread, a typical Thayer’s-type pattern was evident, but again there was that nagging contrast between the black outer web of P10 and the much greyer inner web. Another fine example of an individual that initially looks great for Thayer’s Gull, but closer inspection seems to place it somewhere in the “grey zone” where an extreme Kumlien’s Gull (or possible Thayer’s x Kumlien’s intergrade) cannot be safely eliminated. 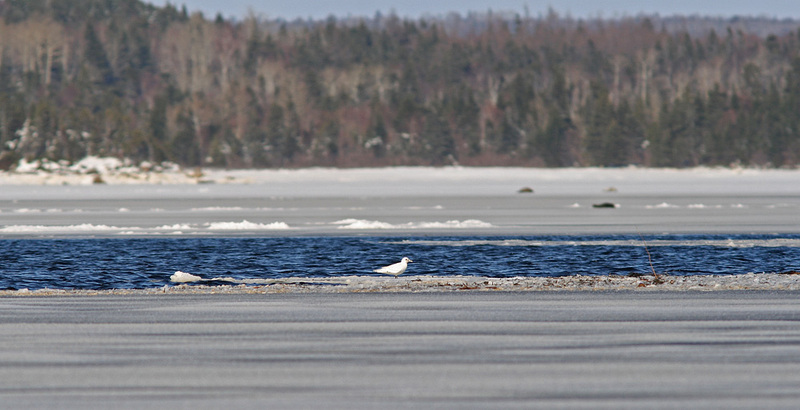 The only gull in this post from outside St. John’s, I found and photographed this individual at the small landfill in my hometown of Lewisporte (Notre Dame Bay) on January 2, 2012. (Unfortunately, this landfill has since been closed down … too bad, since I also discovered a Slaty-backed Gull there in 2007). 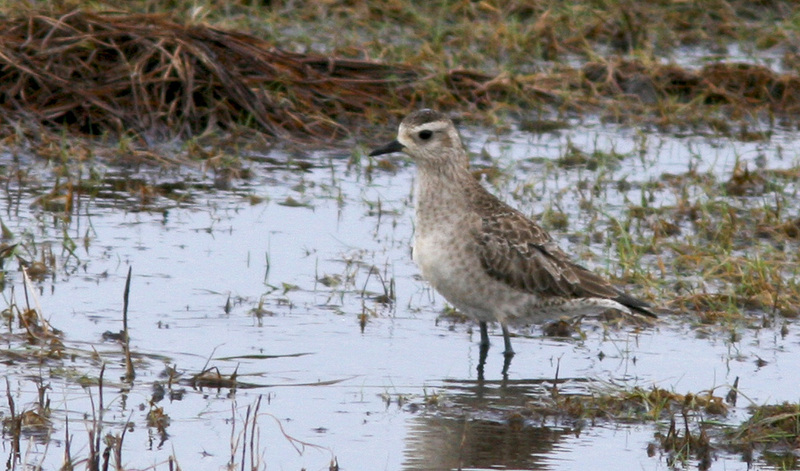 This bird initially stood out from the crowd due to its dark eye, darker mantle than nearby Herring Gulls, and black folded wingtips. Structurally, it appeared slightly less blocky and short-billed than most nearby Herring Gulls, not unlike most Kumlien’s Gulls. Despite all my efforts, I was unable to capture a clear photo of the wingtip pattern, meaning some important details such as the consistency of black across both webs are uncertain. Another one for the “grey zone”!! As in most cases, the combination of a dark eye, black folded wingtips and slightly darker grey mantle makes Thayer’s Gull candidates like this one stand out from local Herring and Kumlien’s Gulls. An initial strike against this individual, however, is its relatively petite structure – certainly not out of the range of normal for a Thayer’s Gull, but not at all helpful in eliminating the possibility of an extreme Kumlien’s Gull or hybrid combination. 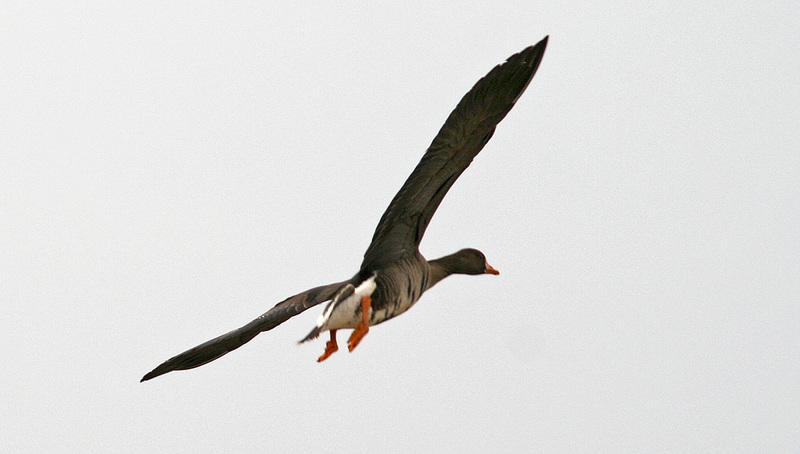 These two flight shots leave a lot to be desired in helping produce an identification. The first does indicate a good Thayer’s type wingtip pattern in P6-10, including a significant black subterminal mark on P10 and a fully black leading edge to P9, but is too blurry to show the consistency of black across the webs or the pattern on P5. 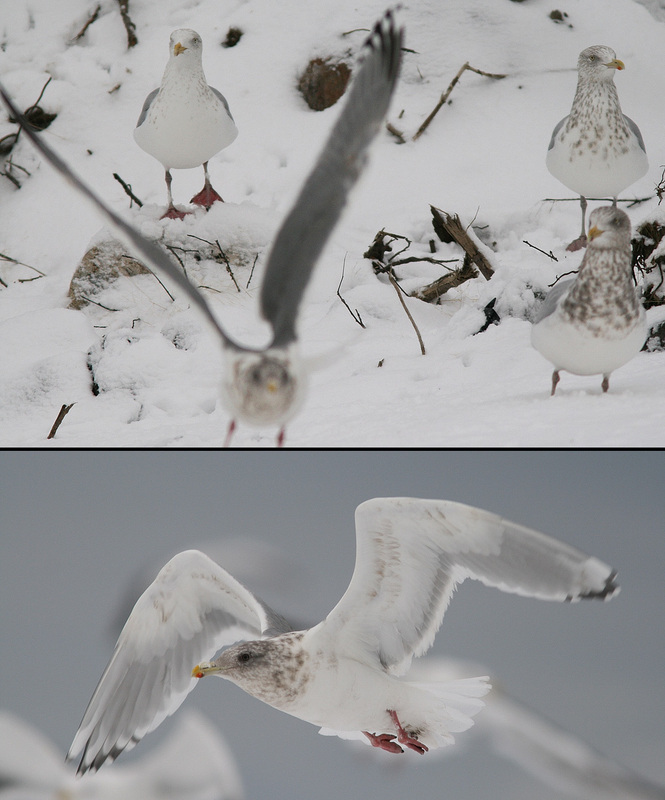 The second photo, showing only the underwings, suggests a lack of markings on P5 – a feature shown by only ~25% of Thayer’s Gulls. So there you have it – a few short comments on the challenges of identifying a solid adult Thayer’s Gull in Canada’s most easterly province 😉 While intriguing candidates seem to be showing up pretty much annually these days, a perfect storm of issues has made it difficult for us (or maybe it’s just me?) to feel comfortable calling them the “T word“. There is such a huge variation in our local Kumlien’s Gulls that ruling out an extreme example of that critter is no walk in the park. Thayer’s and Kumlien’s Gulls can overlap in almost every feature, and finding a candidate with a full suite of Thayer’s Gull traits that might be considered out-of-range (or at least very atypical) for Kumlien’s Gull is key to making a safe identification – and not so easily done. And we know so little about proposed Thayer’s x Kumlien’s Gull intergrades that it is impossible to rule out such beasts. Another complication to consider is that some Herring Gulls (especially northeastern smithsonianus and European argentatus) exhibit less black and more white in their wingtips, producing a pattern similar to Thayer’s Gulls. (That opens up a whole other can of interesting worms and should be fodder for another blog post. 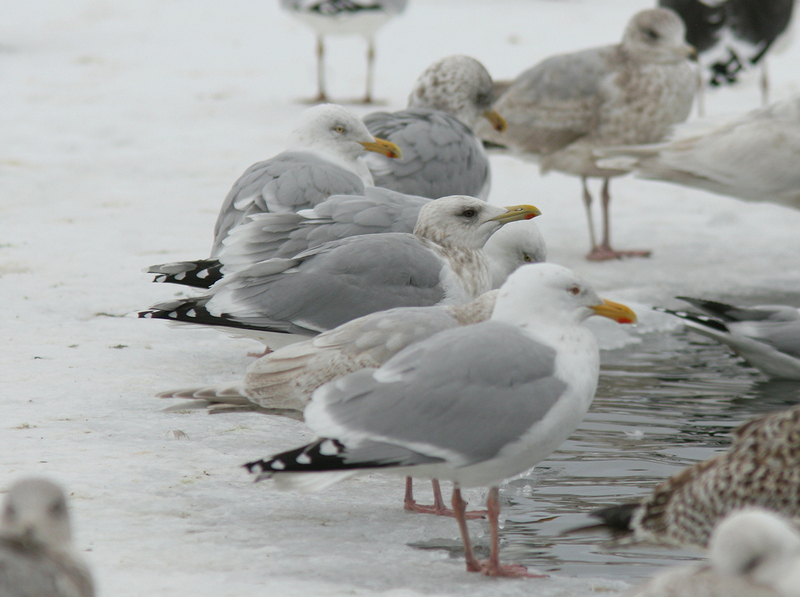 I’ll challenge Bruce Mactavish to write about these interesting Newfoundland Herring Gulls – this is a test to see if he’s read this far!) Obviously, other characteristics should help in the elimination of these taxa. In the end, we have had to learn to let a lot of these gulls go unidentified. Admittedly, none of the individuals discussed above could ever be accepted as a Kumlien’s Gull – they’re just too extreme, and in reality are much closer to Thayer’s Gull. In fact, some or all of them may very well be the latter. No doubt not a single one of the birds above would garner even a second glance among a flock of Thayer’s Gull on the west coast. On a final note (and probably getting myself into a little hot water), I begin to wonder how many of the “Thayer’s Gulls” reported and generally accepted in other parts of eastern North America would stand up to such scrutiny. And what would that really tell us if we found them to be much like the individuals discussed above? Would it simply bring into question their true identities, or would it lend more credence to the possibility that our own candidates are in fact Thayer’s Gulls? We just don’t know enough about these incredible creatures. Olsen KM (2004). Gulls of North America, Europe and Asia. Princeton University Press. New Jersey. Howell SGN and Dunn J (2007). 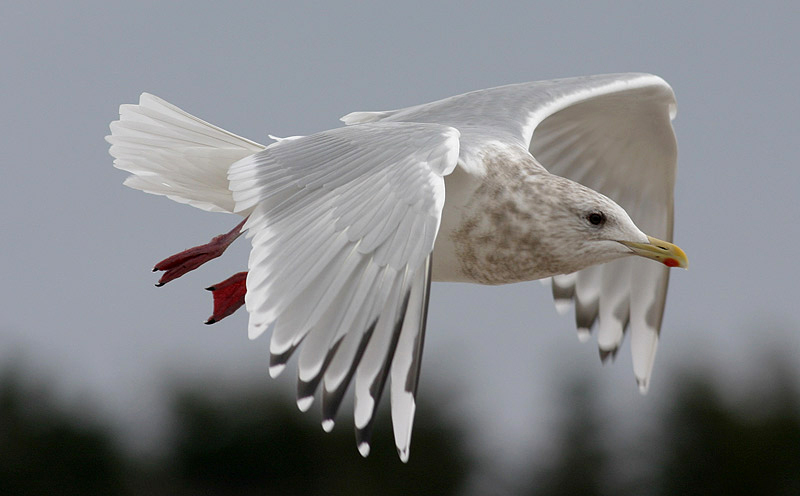 A Reference Guide to the Gulls of the Americas. Houghton Mifflin Company. New York. Howell SNG, and Elliot MT (2001). 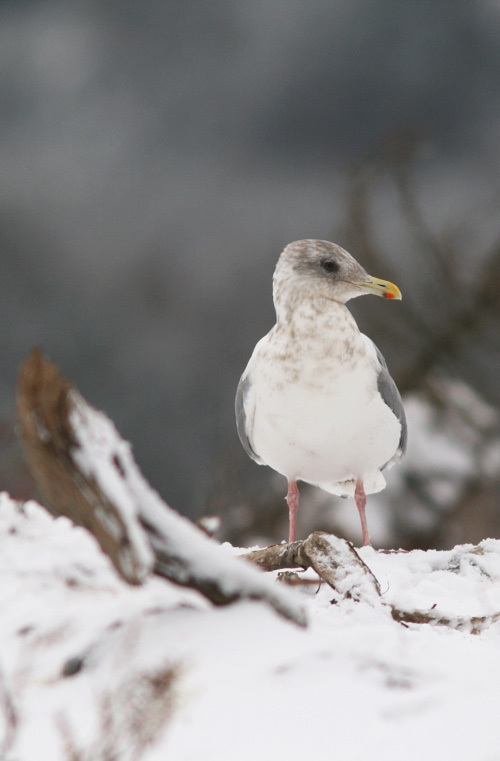 Identification and variation of winter adult Thayer’s Gulls, with comments on taxonomy. Alula 7: 130-144. Howell SNG, and Mactavish B (2003). 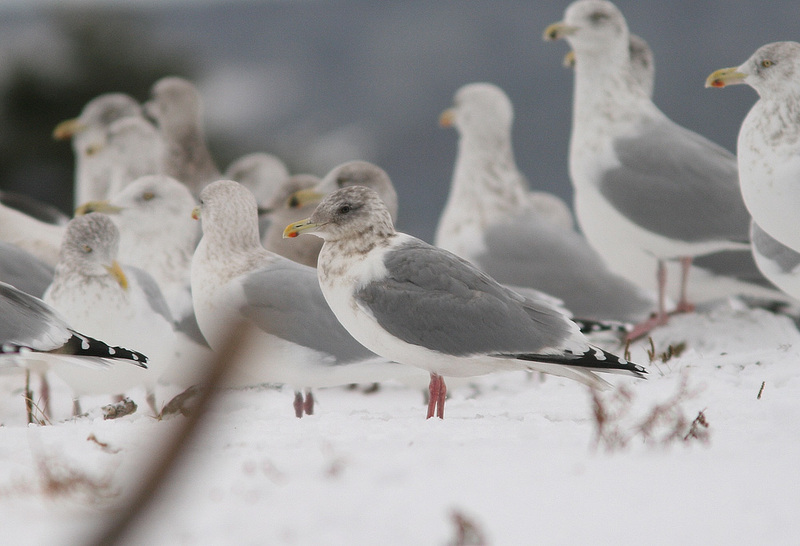 Identification and variation of winter adult Kumlien’s Gulls. Alula 9: 2-15.